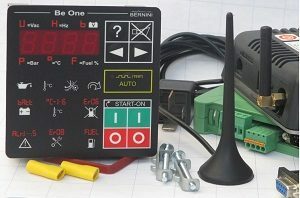 Use the Be1 auto start kit. You have only to add two automotive relays, some wires & terminal block. By using the configurable IN/OUTS lines, you can arrange the controller for any automatic configuration. It has a small size IP65, 96x96mm and operates in between -30°C and +70°C. The Be1 Auto Start Module is suitable for gasoline engines. It directly interfaces with the flywheel generator and provides an output specially designed to stop a gasoline engine. 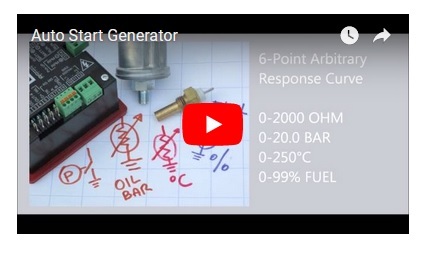 Open the AUTO START GENERATOR CIRCUIT page. Battery supply voltage: 5.5Vdc to 36Vdc. Supply current: 10 mA to 80mA. Inputs: digital (switch) or analog (0-1000 OHM). Dimensions: 96X96X 47(mm). Panel Cut-out: 91mm X 91mm. Ingress protection: IP65. Outputs: 300mA, NPN short circuit proof. Operating temperature range: -30 deg C up to +70 deg C. Humidity range: 5% up to 95% non-condensing. A) - Push one of the [ I ] push buttons until the display indicates the message [MAn] and all LEDs illuminate; release the button. B) - Push one of the [ I ] push buttons until engine starts . When the engine is running, the green LED 'START-ON' will illuminate. C) - To stop the engine, push the [ O ] push button until the [StOP] message appears on the display. If the engine has already stopped, it is possible to cancel the STOP sequence by pressing the [ O ] push button. Push [ O ] when the engine is not running if you want to shutdown the panel. Push the [AUTO] push button until the yellow LED 'AUTO' on the button will illuminate (*). The engine starts when you activate the input configured as 'Remote Start Input'. In the same way, the engine stops when you deactivate the 'Remote Start input'. In AUTO mode of operation, the Be-1 will periodically test the engine if you properly programmed the scheduler or the so called 'Periodic Auto Start'. During this test, the yellow LED AUTO will continue to blink. Please note that Be1 stores, in a 'NON VOLATILE MEMORY', the AUTO mode of operation status. This means that in case you remove and re-apply the DC supply, the Be1 will automatically enter the AUTO mode of operation. To exit the AUTO mode of operation, you can push the [AUTO] push button for a short time; the Be1 will enter the MANUAL mode of operation. You can directly push one of the  push buttons. In this case the Be1 will directly enter the OFF mode of operation. Note(*): if the display blinks indicating the message [ALAr. ], consult section 8.0 of the user manual. You are required to cancel the alarm in the first place before using the AUTO mode of operation. C) - 4 LEDs indicating Oil pressure, Temperature, Fail to start and Over speed shutdown. To browse the alarm memory push the [→] pushbutton. In order to display the details of the alarm, push the [ ? ] push button. To clear the alarm from the panel, remove the cause of the alarm and then press the [ O ] push button. The Be1 automatically terminates the crank when the engine starts running. The Be1 provides an excitement current for the charger alternator. When the engine is not running, the voltage of the terminal D+/WL is 0V (in your car, before starting the engine, the red 'DYMANO LAMP' turns on). 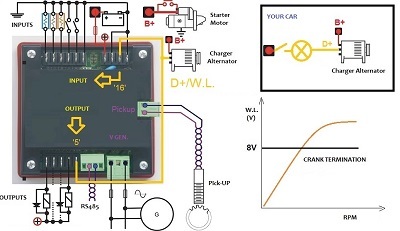 As soon as the Be1 starts the engine, a voltage appears in the D+/WL terminal and when the engine runs normally, the voltage of the D+/WL terminal increases by up to 13-14 V (in your car, having one side of the lamp connected to the battery plus, the red 'DYNAMO LAMP' in the dashboard turns off ). The safest point to terminate the crank is in between 6V to 10V. In case of a gasoline engine the belt alternator is not normally available. 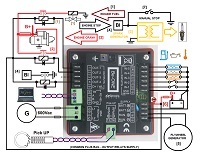 In this case you are required to connect the engine running detect circuit in a 'floating mode' as indicated in this wiring diagram. In order to remotely control the generator, we recommend that you use our MODBUS-USB converter. You can connect a computer up to 1000 m far away via a shielded twisted pair cable. You can monitor and control your generator by running our free of charge software for Remote Control Monitoring BE1 V1.6. Contact us to get a free of charge copy of the software. F) – You can select [E 01] (the last event) up to [E100] (the oldest event) using the [←] and [→] push buttons. G) – To display the code of the Event, push the [?] pushbutton (see table 4.10 in the installation manual).